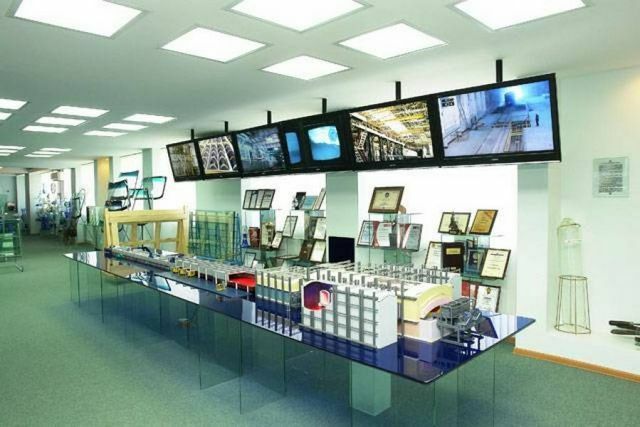 The exhibition hall is the keeper of the best traditions of the Saratov factory of technical glass and witness the achievements of Saratovstroysteklo. At Saratovstroysteklo JSC, the access control is in effect. To visit the exhibition hall (excursion), you must write an official letter addressed to the CEO with a request to conduct an excursion. In the letter you must specify the desired date, the number of people along with accompanying. The maximum number of people in a group is 15 people. The excursion is carried out after agreement of the letter by the general director. Excursions for schoolchildren are conducted starting from the 9th grade. In this room, you seem to go back decades. From stand to stand, as in retrospect, you can see rare footage of half a century of glass factory: laying the foundation and building the first workshops, starting the rolling line and conveyor line ShPS-1000, reconstructing the production of sheet glass, developing new types of products and modern technologies. Here are the product samples that were produced earlier, the company's awards are kept - numerous certificates, diplomas, letters of appreciation. 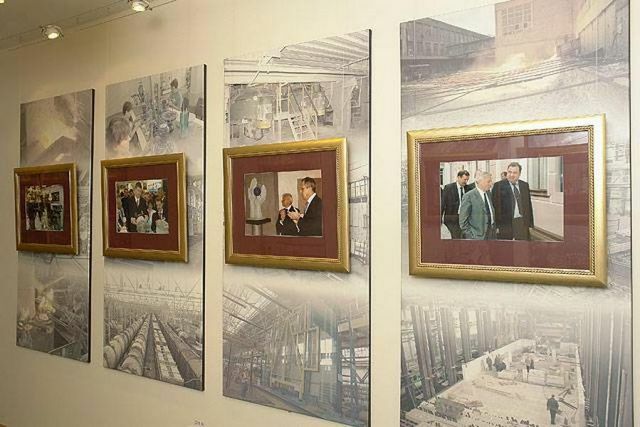 Over the years the exhibition hall has been visited by many famous and respected people. They are foreign and Russian diplomats, government and public figures, representatives of the clergy and creative intelligentsia, cosmonauts, sportsmen and many others. Guests express their admiration for what they saw and recognition of the skill of the Saratov glassmakers with sincere and warm words in the guest book. The hall of new technologies produces indelible impression on numerous visitors and guests. Exhibits exhibiting a wide range of modern glass applications are exhibited here: a double-glazed window with electrochromic glass that allows adjusting the light transmittance, a double-glazed window with guided blinds embedded between the glasses, retaining its tightness and heat-saving properties, molded glass samples, a volume sculpture made of crystal, a panel with laser engraving. Visitors pay special attention to the Living Glass exhibition. 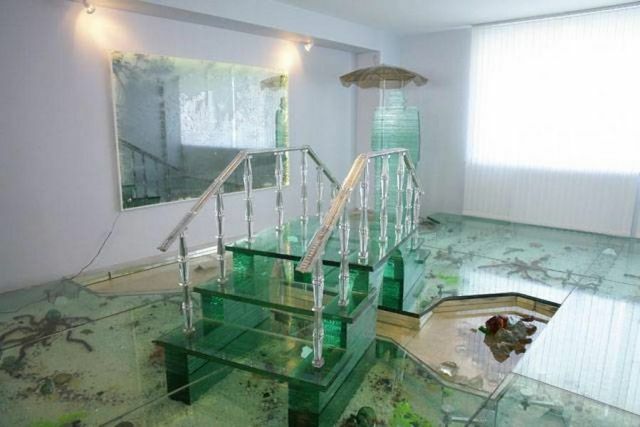 The transparent floor, the glass bridge over the stream, the mysterious “rain man” demonstrate the decorative possibilities of sheet and multi-layered architectural and building glass and an unconventional approach to this material. Fascinating and leaves no one indifferent exposure of luxury products made in single copies. Almost all of them are exclusively handmade and represent a variety of directions - from classic to avant-garde. Long-term traditions, enriched with the knowledge of modern technologies, have allowed to create new highly artistic products that are notable for their special grace and unique style. Products made of crystal in a frame of bronze, silver and nickel silver, inlaid with ornamental stones, surprise and admire with their refinement. 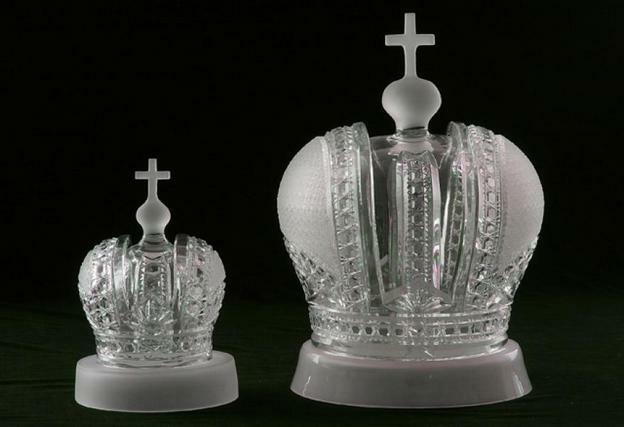 Here are copies of products, presented at various times as a gift to famous people: crystal chess for Brezhnev, the crown of the Russian Empire for Yeltsin, Mithras for the Patriarch of All Russia Alexy II, the crystal orchid for Mireille Mathieu. 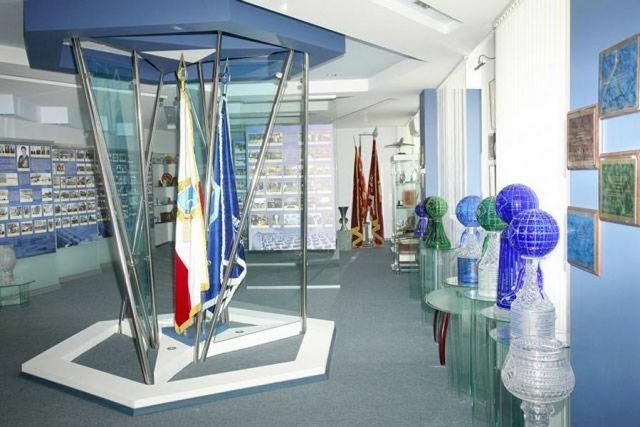 In this hall, samples of float glass of various denominations produced by JSC "Saratovstroisteklo" are demonstrated; automotive, tempered, bulletproof and laminated glass, varietal utensils, decorative vases and souvenir products made of glass and crystal. In this room you can also get acquainted with the complex process of making polished glass. For this, a unique exhibit was assembled - the layout of the float line, reproducing the real line to the smallest detail. Above it are six monitors, simultaneously broadcasting all stages of glass production.